The Museum of Jewish Montreal hosted a lecture and tasting to celebrate the recreation of a 200-year-old traditional beer recipe from the famous Jewish Hart family brewery, on Oct. 26. Nearly 100 people gathered in the bright main room of the museum, which opened only eight months ago. At 7:30 p.m. sharp, the room, already filled with displays of famous Jewish literature, historic maps and archival photos, was packed with eager and thirsty attendees. The almost illegible manuscript of the beer recipe was displayed at the front of the room, in front of rows of chairs, for everyone to see and attempt to read. The Museum organized the event in collaboration with Fletcher’s Espace Culinaire and Le Réservoir microbrewery. Fletcher’s, a Jewish-Québécois fusion café, offered their space on the main floor of the Museum, for the event to take place. Julia Dubé, the event and financial development coordinator for the museum, said the team first discovered the beer recipe when one of their research fellows stumbled upon a beer blog talking about it. Le Réservoir, a microbrewery on Duluth Avenue, just a street corner away from the museum, accepted the challenge to recreate the beer. Concordia graduate and master brewer at Le Réservoir, Nathan McNutt, made it his mission to follow the recipe and the methods used as closely as possible. 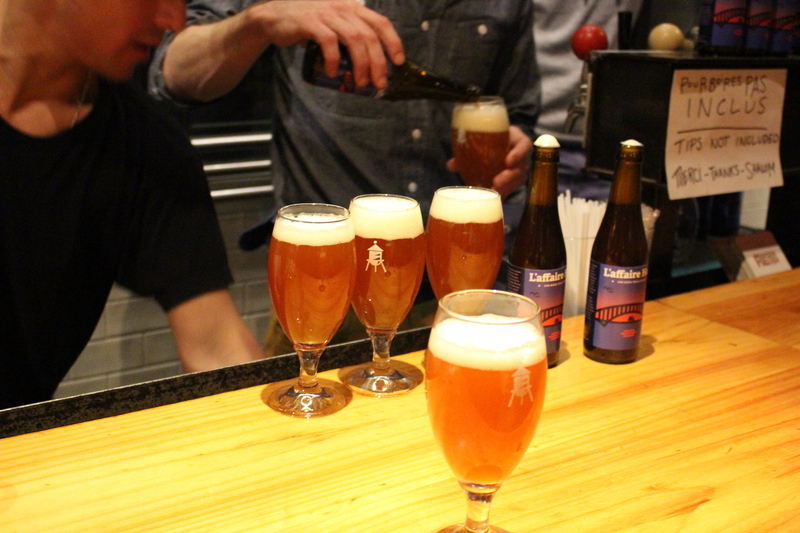 “We are all very excited to taste the beer for the first time,” said Dubé. The museum is dedicated to sharing Jewish stories in Montreal. Since the Hart family is such an important name in Montreal’s Jewish community, this was a story the museum couldn’t pass up on. “Part of these stories relate to food, relate to beer. When we found this story, we thought it would be a very contemporary and interesting thing to share,” Dubé told The Concordian. The Hart family are known to be the first Jews to have arrived in North America. They settled in Trois-Rivières in 1761. The entire family is celebrated for their contributions and devotion to Quebec’s Jewish community. The family created the first synagogue in Canada and were active in the fight for Jewish political rights during the 18th century, according to an article on Canada’s History’s website by author and historian, Denis Vaugeois. That’s why, Montreal-native beer blogger and business lawyer, Gary Gillman, was surprised to stumble on the Hart name when researching early Quebec breweries. “Growing up here in the Jewish community, we all had known of the Harts and were very proud of them … but we knew their political history, particularly Ezekiel’s situation with respect to trying to set a legislative assembly in the early 19th century. I had no idea that they operated a brewery,” said Gillman. Gillman found the recipe through public provincial records. In fact, it was so easy to access, he continued digging to see if anyone else had published or at least found the manuscript. “As far as I could tell, nobody actually found it and published it, much less analyzed it from a brewing point of view,” said Gillman. He published a blog post about the beer in February 2016. The brewer of the beer, McNutt, said, “For the most part, we kept very true to the style, very true to the ingredients. We made sure that [the beer] was Quebec-grown, that it was organic.” He explained he had to make certain adaptations to stay true to the original recipe, techniques and style of the brew. He said he used smoke malt, with the help of wood chips, to replicate a taste that was common in 18th century beer. He also added wild yeast to the beer, and aged it in an oak wood barrel, which he said added complexity to the beer’s taste. Among the guest speakers at the event was Vaugeois, who was particularly touched by the recreation of the recipe. Vaugeois, who wrote a book about the Hart family, imparted his knowledge about the Harts to the crowd. “Since I don’t drink beer, I focused on the brewery, on the will of Aaron Hart to bring his sons together so they could create a dynasty. He created an enterprise for his sons, like Molson,” said Vaugeois about his book. Vaugeois said that upon researching and writing so much about the family, he felt like he had a special connection to them. “I feel like I am myself a Hart,” he said. Once the presentation from guest speakers was over, guests were invited, with their free beer coupon in hand, to the next street corner to taste the celebrated beer for themselves at Le Réservoir. As the speakers hinted, the flavour of the beer was beautifully complex. From the balanced smokiness, to a nice spiciness and subtle yet satisfying bitterness, this beer’s taste was a nice surprise.